Bimini is located just 50 miles east of South Florida coastline and is accessible by plane or by boat. The first item to remember is Bimini is in the Bahamas and requires a valid passport for travel. Bimini International Airport on South Bimini is a small airport. Upon arrival, you’ll clear Bahamas Immigration, pick up your luggage and clear Customs, As you exit the terminal, several taxi vans will be waiting – they are pretty much time their schedules based on scheduled arrivals and communication with the airport as to inbound charters. Please take one of these vans to the ferry dock, and transfer by water taxi to Bimini Big Game Club Resort & Marina. The water taxi will dock near Reception at the resort. The entire transfer from airport to resort takes approximately 10 minutes. The charge for the combined van and water taxi is $7.00 payable in cash only. Bimini is the perfect destination for a day stay or a few hour stay – since it’s just a short 50 miles from South Florida. Bimini International Airport is just a short distance from the resort and provides Bahamas Customs, Immigration and has a 5600’ x 100’ runway. To find out more about flying privately to the Bahamas please click here for the most up to date information. Upon arrival to the marina, you must clear your vessel and crew with Bahamas Customs & Immigration, which is located a short stroll from the marina on the resort property. Visiting boaters must clear customs and immigration in Alice Town. As you enter port, fly the yellow quarantine flag. Once docked, the captain is permitted to leave the boat in order to clear the boat and crew with local customs and immigration. All crew are required to remain onboard until the captain returns with vessel clearance. All boaters entering The Bahamas are required to pay an entry fee. Note: Customs and Immigration accepts CASH ONLY. Departure Tax for up to three (3) persons. Each additional person above three will be charged a $25 departure tax. This fee is good for a second re-entry within a 90-day period – be sure to keep your receipt. Bahamas Customs and Immigration office hours are from 9 a.m. to 5 p.m. weekdays. Officers are on call during holidays and weekends. There is no overtime charge. 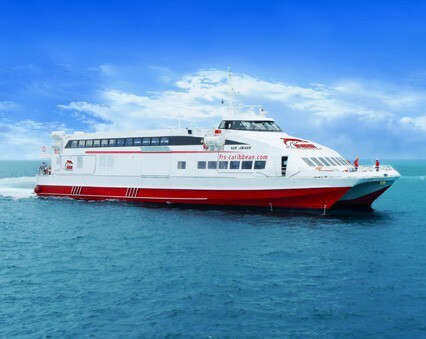 FRS Caribbean offers ferry service from Miami to Bimini, letting passengers enjoy a quick, easy and relaxing day trip onboard the HSC “San Gwann” with affordable overnight and day trip prices. 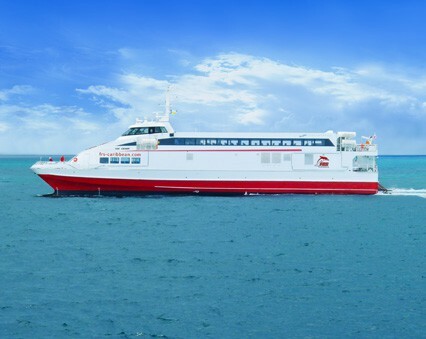 HSC “San Gwann” is part of the FRS Caribbean Fleet, crossing in just 2 hours is capable of hosting 427 passengers with comfortable seats. It is equipped with a Bar-counter in both passenger decks, where passengers can enjoy refreshments and snacks during their voyage and a duty free shop to end a getaway with some mementos and gifts. FRS Caribbean has made its home at Port Miami, Terminal H, where passengers are able to park nearby for the day or overnight. FRS Caribbean’s Call Center is available for reservations and inquires Monday – Saturday from 9:00am to 7:00pm and Sundays from 9:00am to 1:00PM. If you have a firearm on board, you must declare it with Customs. You must provide the serial number and manufacturer, plus an exact count of ammunition. You are allowed to have a firearm on your boat, but you cannot take it off unless you have a permit from the Bahamian police ahead of time. Weapons must be under lock and key at all times. Any infraction of this law is dealt with severely. You receive a Cruising Permit upon clearance and payment of entry fees. Upon issuance of your Cruising Permit you will also receive a Fishing Permit. Fishing gear is restricted to hook and line and you’re allowed to fish with no more than six rods at a time per boat. Cruising or fishing without the proper permits or in violation of bag limits can result in severe penalties. This includes stopping to fish or dive in the waters off Bimini prior to clearing.